Our hands are an expression. From high fives and thumbs ups, to fingers crossed and fists, our hands make a statement without words. There are certain gestures that can heal the body physically, mentally, and beyond. Mudras are hand positions that affect the energies of the body. These sacred symbols can guide you into deep meditation or soothe an ailment. They can calm you, or ignite you into action. They are typically practiced during yoga or meditation, and in some instances, other parts of the body are incorporated. 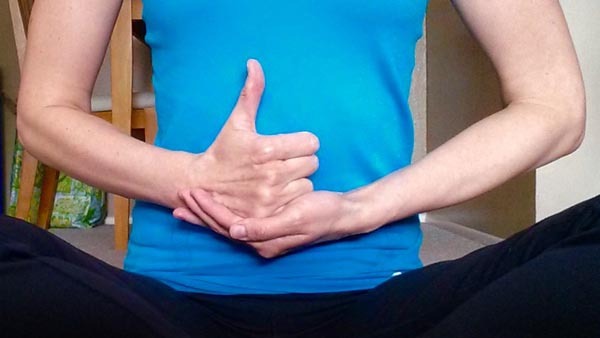 The mudras below are paired with suggested yoga poses, but can be practiced lying down, sitting, or standing. Some can be held for long periods of time, but for the sake of this basic introduction, we will hold each position for five breaths, and work upward from there. Always apply gentle pressure to the fingers and hands and keep them relaxed. How: Shape your left hand like a bowl while keeping the fingers together. Place your right hand on the left palm, with the thumb facing up, and the rest of the fingers tucked into the palm. Traditionally, the hands are placed at the level of the abdomen. Benefits: Replenishes energy, helps relieve depression. How: Place all 10 fingertips together. How: Press the outer edges of the thumbs and pinky fingers together as you spread the rest of the fingers wide. How: Form a bowl shape with the hands, left on top of the right. Touch the thumbs together, and place the hands in your lap. How: Press the palms together with the thumbs resting gently into the chest or between the eyebrows. Always practice mudras with respect and patience. Stay in a soft, focused state, with your eyes closed or halfway closed as you explore. Take full inhales and exhales without force, and see where the mudras lead you! Do you use mudras during meditation and yoga? How have they impacted your practice?